Competition officials presented, middle from left to right, Matthew Etreni, Ryan Ferguson, Sabeera Azhar, and Dylan Paxton with a cheque for $3,000 for placing first in the ACHIEVE case competition. 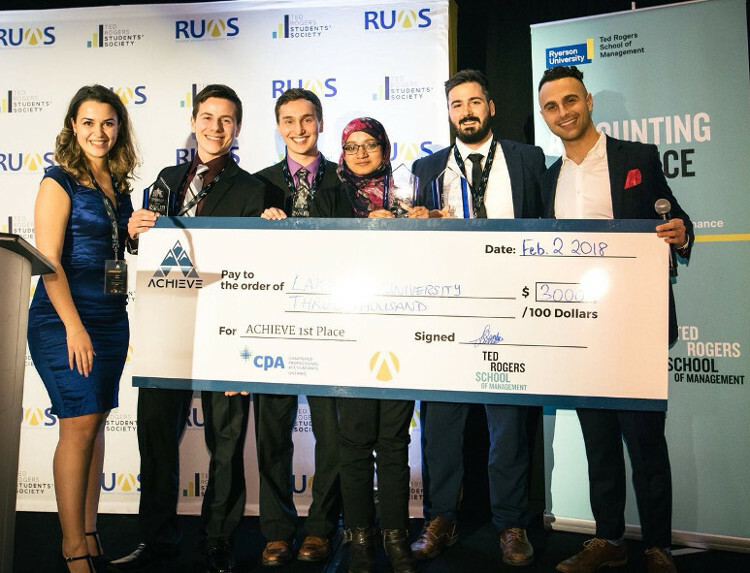 Lakehead University accounting students Dylan Paxton, Matthew Etreni, Ryan Ferguson, and Sabeera Azhar earned first place in the case competition held at the ACHIEVE Conference, February 1 and 2. ACHIEVE is Canada’s premier undergraduate accounting conference, hosted by one of the most distinguished and largest business schools, the Ted Rogers School of Management. This year’s case competition dealt with persevering in the face of pressure from superiors to bend the rules. Sixteen teams from across Canada participated in the two-day conference at the Marriott Downtown Eaton Centre Hotel in Toronto, which included an accounting-based case competition, guest speakers, and networking events. “I was extremely fortunate and proud to compete with such amazing representatives of Lakehead University, against very strong accounting teams across Canada,” said Paxton, who is also the President of Lakehead University’s Accounting Club. “ACHIEVE was a once in a lifetime experience. Our win was due in no short order to the hard work of the Lakehead University Accounting faculty who invested their own time to help us prepare for the competition,” he said, adding that the support provided by Dr. Sayed, Dr. Lento and the rest of the Accounting department was second to none. “We look forward to defending our title next year,” Paxton said. The first place win comes with a trophy and $3,000 in prize money to share between the students. The Lakehead University Accounting team also won the BASC competition held in Winnipeg last year. "I am so glad that I had the opportunity to represent my school at one of the biggest accounting competitions in the country,” Azhar said. “As I come to the end of my undergraduate studies at Lakehead University, I want to thank all of my professors for their hard work and dedication to my education, which has allowed me to be successful at the Achieve Competition and Conference,” she said. The Faculty of Business Administration is accredited by both the Association to Advance Collegiate Schools of Business (AACSB) and Chartered Professional Accountants of Canada (CPA). Fewer than five percent of business schools in the world have AACSB accreditation and only 15 business schools in Canada have this dual accreditation.